A rope ladder is spread out across the gym floor at Deh Gáh School. Students hop through, knees kicking up high. Then on to brightly coloured cones spread evenly in a line, feet weaving to the left and right. “Now, do the same with a ping pong ball,” says Thorsten Gohl. And they do. They’ve been practicing for a few weeks already, since the school year started. For the past two years, Gohl—a professional table tennis player from Germany—has been drilling them on the basics, and the not-so-basics of the sport. Some of them are getting it: One boy is comfortable and confident, tapping the ball over his shoulder as he brings his paddle behind him and sends it back over to the front. Others are disinterested, to say the least: A boy in a black cap walks into class late and swiftly kicks an orange cone, which lands about a metre in front of my feet and takes a seat on the bench. By the end of the day, shards of white plastic ping pong balls are scattered across the gym like eggshells. The students pick them up, along with the balls that are still intact. And they keep playing until the doors are locked for the night. It’s a good place to be in a small town with few other things to do. On the side of the highway to Fort Providence, bison with massive heads and dwarfed back legs sit in clusters. Paintbrush tails are the most active part of their bodies. I was hitching a ride from Yellowknife with Deh Gáh School principal Lois Philipp. We’d left at 6 a.m. and we weren’t stopping for the bison, or even to grab a coffee once we reached Fort Providence. Had we popped into the truck stop on the highway just outside of town, I would have been given a primer on what was going on in the community. Newspaper articles, event posters and advertisements are pinned up around the door: Boat for sale, truck drivers wanted, floor hockey starting up at the gym. There’s a missing person poster: a young man from Fort Providence hasn’t been seen since April 2015. Like many communities in the North, this town of 750 along the shore of the Mackenzie River is grappling with how to keep youth out of trouble. There’s been a spree of break-ins throughout Fort Providence in the last year. A petition was launched calling for the banishment of troublesome youth, but the drive behind this cold solution thankfully lost steam. Fort Providence Chief Joachim Bonnetrouge has called the crimes a cry for help. He’d like to see an on-the-land camp established as an alternative to the justice system, with the aim of rehabilitating local youth by connecting them to their traditional culture. But the main question is, how do you steer kids away from crime and keep them out of crowds that breed it? This is a challenge for the entire community, and especially for Philipp. A week before I arrive, a group of students—some as young as seven—had just returned from 30 days in the bush with elders and leaders from the community. Every day they were hunting, harvesting wood and checking nets. There were no processed sugars, just berries they could pick if they wanted sweets. They ate a whole moose in eight days. Back at school, the push for healthy choices is reinforced. After our three-hour drive into Fort Providence, I barely see Philipp as a steady flow of traffic streams in and out of her office. We eventually sit down at the small, round table next to her desk and she tells me her philosophy on education. In the fall of 2013, two faculty from Deh Gáh School travelled south for a table tennis coaching clinic. Then vice-principal Jim Snider’s father-in-law got him into the sport. Snider was surprised by the physicality and technicality of the game. He got his colleague Jeremy Kielstra on board and soon they were playing on old tables they found in storage at the school. They were playing a lot, and they wanted to get students involved, so they signed up for a coaching course in Vancouver to make that happen. “We were in way over our heads,” laughs Snider. (One of the other participants was a Canadian Olympian.) But they came back from the training with a lot to share—and a coach. Standing well over six feet with curly brown hair to his shoulders, coach Thorsten Gohl is easy to pick out when I first arrive in Fort Providence. He’s dressed in shorts and running shoes, despite the temperature hovering just above zero. He has a camera perpetually slung from his neck. When students aren’t calling him The Ping Pong Guy, they call him The Photo Guy. It’s not a stretch—he is a photographer by trade. With Philipp's support, Kielstra and Snider organized Gohl’s first visit to the North shortly after their Vancouver coaching camp. In the North, of course, nothing is so simple. In order to get funding from the territorial government to bring Gohl up and purchase supplies like new tables and paddles, they had to establish an official organization: Table Tennis North. 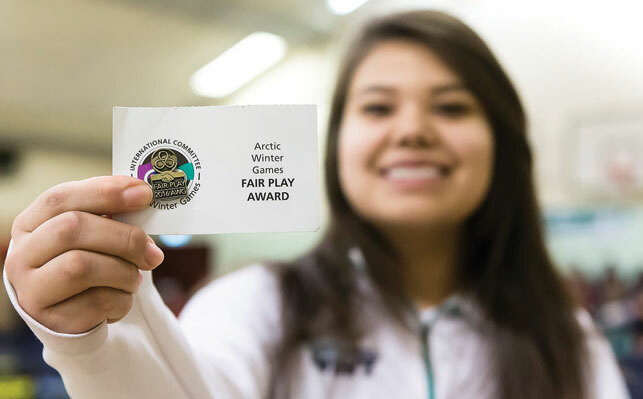 They also had to host table tennis tryouts for the 2014 Arctic Winter Games—an international tournament held every two years for athletes from across the circumpolar world. The NWT sent eight athletes to compete in table tennis that year but no one medalled. The sport has been gaining momentum nonetheless; Gohl is here to keep that going. He's taken to the North, as so many do, and is living in a blue trailer just off the main drag in Fort Providence. Bison wander into the swathes of grass between the houses at night, leaving behind dinner platter-size piles of dung. Gohl spends most of his days—at least while I’m in town—at the school, coaching table tennis. He also manages the Table Tennis North website and works on getting funding to take the sport across the territory. Though all of this, he clarifies, is strictly volunteer. By the end of the year, he’s hoping to have his work visa in place in order to be a paid employee of the District Education Authority, since the one he was granted after studying photography in Canada has expired. A recent graduate of Deh Gáh School, Mikaela Vandell spent the better part of the fall working with Gohl and coaching students in table tennis. She’s tall for a 17-year-old, slim, with long dark hair piled on her head. She walks into the school gym before classes start with a pink travel mug in hand. The territorial championships are a month away and there's work to do. The next round of the Arctic Winter Games are also on the horizon, but 2018 is a long way away. Vandell’s been playing for two years and competed at the games in Fairbanks, Alaska in 2014 and again this year in Nuuk, Greenland. She learned a lot. “The first year was so bad. It was like, everyone was so pro and we had just started out,” she says. “We knew basic table tennis stuff, we were really like, ‘Oh geez, we’re not going to make it into the finals’ because everyone was taking it so seriously.” Realizing what it would take to succeed, she worked on her serves, her returns and her fitness before and after school—she did a lot of jumping jacks. She’s been through the wringer. Now she can help others through it. On Vandell’s direction, the class of middleschoolers line up at one of the tables. She serves to the person at the front of the line and then returns it to the next. The game is called Around the World—you run a lap after taking your shot. If you miss, you do five jumping jacks. He’s got potential, Gohl tells me. These students are starting out younger than Vandell did. Summer Bonnetrouge is nine and she’s been playing for two years already. Standing at one end of the table, she serves diagonally across and knocks a colourful target, sitting just at the edge of the table, clear off. She grins, giggles and serves again. Another player, Neilsen Vandell, 16, says he didn’t initially take to table tennis. It was hard at first to get the spin right. With the paddle in his hand he demonstrates how if your opponent puts a spin on the ball, it can take an unpredictable path—you’re best to return it, if you can, in the same manner. He flicks the paddle with his wrist sending the imaginary ball spinning at me. But he’s getting it. At last year’s table tennis championships, he got third place in the under-18 boys division. Not everyone is a convert. I hear a few mumbles of “Ping pong again?” when a new class shuffles into the gym. The biggest challenge to keeping students interested in activities like this is having consistent leadership, says Philipp. This is hard in the transient North. There have been teachers, like Snider and Kielstra, who are around for five-plus years and really foster an interest in certain sports. But once they move on, as both have, interest among kids often wanes. The leaders who had expectations for them are gone, and with them, the expectations. It's why having someone like Gohl around is so important. I see how he interacts with the kids—playing along with the group. He misses his shot and jumps in the air yelling, “No!” He stamps both his feet in turn, laughing as he does. When I first met him, at a coffee shop in Yellowknife, I asked what he thinks draws the students into table tennis. “I’m a fun guy. I make it fun and I play up the whole ‘my name is Thor,’ thing,” he said, laughing. She’s grown up playing sports but with most games requiring more than two players, she says gathering enough people can be tough. In soccer, she always played on teams from other communities. 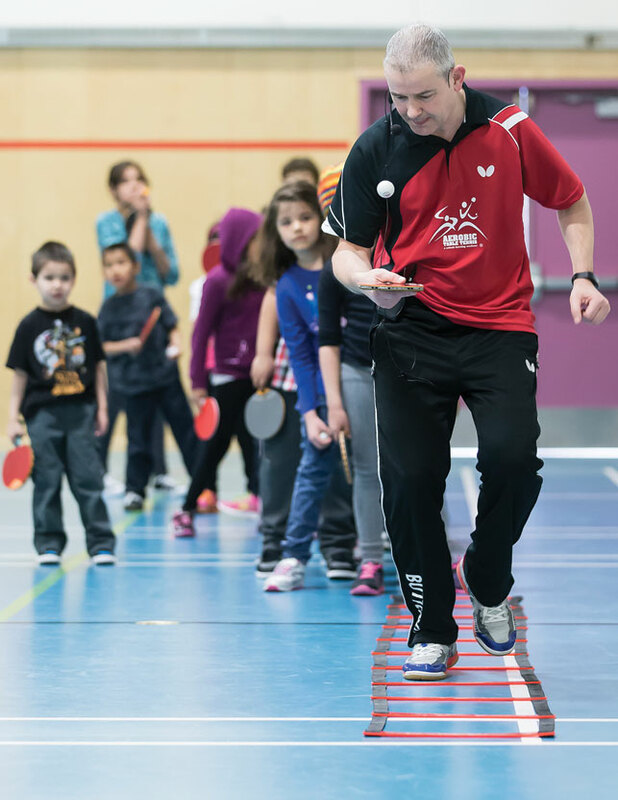 Numbers are a challenge for a lot of places—a reason Table Tennis North has a territory-wide scope. “I must say, I’m a dreamer and crazy sometimes,” Gohl says. “I said when I came here, ‘In a year’s time, I want to do 20 communities.’” He made his move to Fort Providence in September 2015, and while 20 may have been a lofty goal, he’s already hit 11. Back in the gym, the school day is over but some familiar faces from the day’s classes have returned. The tables are still set up in a line in the middle of the room and the pile of paddles sits on the floor. “Is it open? Can we play?” a boy in a black hoodie asks, walking into the gym. He and another boy in a flat-brimmed baseball cap begin to rally. The white ball travels from paddle to table, over the net to the other side of the table and up to the opposing paddle. “He got served!” the boy in the cap calls out, flicking his wrist in the air as the ball sails past his opponent. They laugh and start it up again. Two girls grab paddles and take up another table. The first serve bounces off the green surface and carries straight through the air, hitting Gohl square on the forehead. “Nice shot,” he laughs. At the far end of the gym, a woman in an orange hoodie starts rallying with a young boy. She has a long dark braid hanging under a baseball cap that matches her sweater. “That’s her grandson,” Gohl tells me. I’d seen her earlier that day, standing at the door of the gym with an apron on. Veronica Bonnetrouge is the school’s cook, as well as the janitor. “She does everything around here,” Gohl says. Her daughter, the young boy’s mother, comes in to play as well. Table tennis reminds Veronica of her childhood. Growing up on the Akwesasne Mohawk reserve in southern Ontario, she used to play with her brothers. When Snider and Kielstra had new tables brought into the school, she salvaged an old discarded one. She laid it across her pool table at home and says she still needs to make new legs for it. It’s something to do, and something to do together with her family. The mother laughs as her son’s shot flies over her right shoulder. Veronica jokes that it’s better than her grandson going home to sit on his bed. Here, all three generations are playing together. Table tennis is becoming more than just something to do.